David C. Jones, husband of Karen (Postma) Jones died August 25, 2018 of congestive heart failure. He was born in Akron, Ohio on April 8, 1932 to parents Ira and Esther M. Jones. Dave graduated from Ellet High School in 1950. He was employed by Goodyear Aircraft prior to entering the U.S. Marine Corps in 1952. 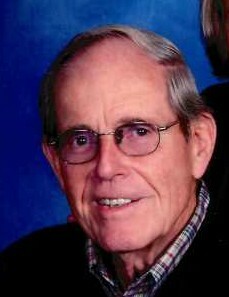 David granduated from Kent State University in 1957 with a Bachelor of Science degree. At Kent State, Dave was a member of the Phi Delta Theta Fraternity, editor of the “57” Chestnut Burr Yearbook, photographer for Kent State and Public Relations office. At graduation, Dave was re-employed by Goodyear Aircraft/Aerospace in the Engineering Presentations Department. He transferred to Goodyear Tire in 1972, where he became Manager of Corporate College Relations responsible for recruiting college graduates for the various squadron programs. Retiring from Goodyear in 1996 with over 40 years of service, David enjoyed working on his uncle’s farm in Tallmadge, earlier in his life and credits this and his many years as a Boy Scout with making many tasks easier in his life. His hobbies included photography, building model boats, airplanes and trains. David also enjoyed sailboat racing and was a past commodore of the South Shore Yacht Club. In his backyard “Jonesy’s Garden Railway” brought great joy to the children in his life. He was preceded in death by his parents, sister and brother in law, Helen and Hugh Thomson of Media, PA; and step mother, Peg Jones. David is survived by his loving wife of 43 years, Karen Lee Postma; brother, Richard (Norma) Jones of Centerville; brothers in law, Robert C. (Phyllis) Postma of Greensboro, NC, James (Jackie Cavileer) Postma of Atlanta, GA, Gary Postma of Lauderdale Lakes, FL, and Jeff (Janina Cavileer) Postma of Tallmadge, and many loved nieces, nephews, extended family and friends. Visitation will be 4:00 until 6:30 p.m. Thursday, September 6, 2018 at the Donovan Funeral Home, 17 Southwest Ave. (on the Historic Tallmadge Circle). Private family service will be held at the convenience of the family. In lieu of flowers, memorial donations may be made to Boy Scouts of America Great Trail Council 1601 S. Main St., Akron, OH 44301 or Summa Hospice, 1077 Gorge Blvd., Akron, OH 44310.